The herb chamomile has a role in traditional and alternative health practices. Two types of this plant are used to make teas. German chamomile and Roman or English chamomile each purport to offer relief for digestive problems. Consult a qualified health care provider before treating gastrointestinal symptoms with chamomile tea. Chamomile has a reputation for possessing relaxing and sedative properties. Some alternative health care practitioners recommend chamomile for digestive problems, particularly those connected with stress. The herb may relieve intestinal gas, diarrhea, upset stomach, chronic heartburn, loss of appetite, nausea, vomiting and motion sickness. Roman and German chamomile have similar active ingredients and are used to treat similar conditions, according to the University of Maryland Medical Center. Although most chamomile research has involved German chamomile, the U.S. National Library of Medicine focuses on Roman chamomile at its MedlinePlus website. While Roman chamomile contains chemicals that can reduce intestinal gas, there is insufficient evidence to evaluate the effectiveness of chamomile for relieving indigestion, nausea or any other health condition. Animal research shows that chamomile has anti-inflammatory and antispasmodic effects, according to the Memorial Sloan-Kettering Cancer Center. If you'd like to try drinking chamomile tea to relieve bloating and gas, the herb is safe for most people, according to MedlinePlus. To prepare the tea, pour 1 cup of boiling water over 2 to 3 heaping tablespoons or 2 to 4 grams of dried herb and steep for 10 to 15 minutes. Drink the tea three to four times per day between meals. If the flavor is unpleasant, add sugar or honey and lemon. Commercial chamomile teas also are available. Because of its anti-inflammatory and antispasmodic properties, chamomile also is used for relieving menstrual cramps, sinus pain and joint pain associated with rheumatoid arthritis. Combined with other herbs, chamomile is sometimes used for treating liver and gallbladder disorders. Chamomile in a steam bath may relieve hay fever symptoms, sinus inflammation, earaches, sore throat and other types of pain. 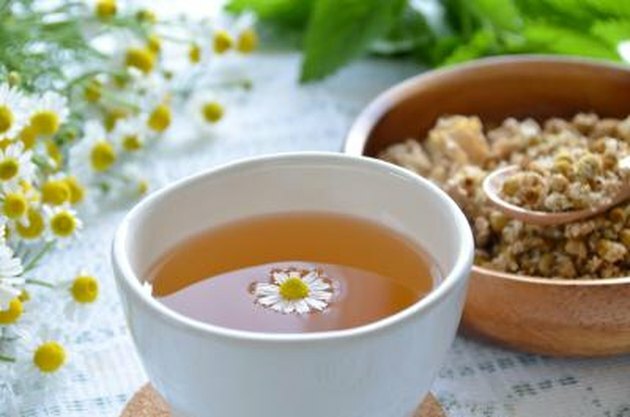 Consult your health care provider before using chamomile tea or other chamomile preparations for any health conditions. Does Chamomile Tea Induce Labor?